I must have driven by this place over 100 times, but when you actually step inside this very popular Thai restaurant, the first impression is that the restaurant is a lot bigger and spacier than it looks from the outside. The Beverly Hills restaurant has been open 15 years and the Culver City location even longer at 25 years and they seem to be showing no signs of slowing down. For a Beverly Hills destination, the prices are extremely reasonable. Portions are large, and although the Thai food served at Natalee Thai may not have the hot spices or street cred that the places featured in the well publicized Jet Tila/Anthony Bourdain television episode have. but you will like what they deliver here. Service is efficient enough, and there seemed to be no pressure from anyone to rush your food so that the table could be re-circulated. and served with a spicy red crust chilli sauce and tomato and cucumber slices. If you like seafood then the Phukat Sea Bass Filet ($15.95) is the perfect choice with some of the tenderest fish you will try. Vegetables all steamed with it are bok-choi, green onions, ginger and black mushrooms and garnished with cilantro. 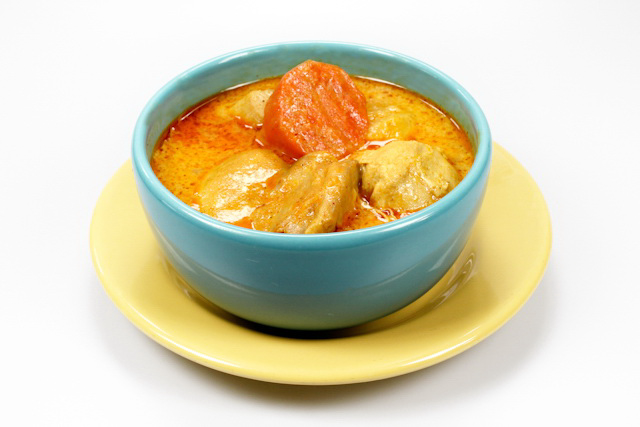 The Thai curries are always worth checking out, and the signature curry here is I believe the California Yellow Curry ($10.75), with chicken slowly cooked in coconut milk with potatoes and carrots. I also tried the Pineapple Crab Fried Rice ($13.75) with all kinds of extras like onions, egg, carrots, scallions, tomatoes and pineapple chunks. If you are on any kind of budget, then the white steamed rice at $1 has to be the deal, or even the sticky rice at $1.50. The drinks here are another story and I mean that in a good way. The signature cocktail is a massive gargantuan assemblage of liquids known as the Volcano cocktail. You need some sort of prize to finish this and it is certainly a drink to share and even then there will be some left over. There are also plenty of beers and wine to choose from, and if you want to plan your meal before your visit, then the website is one of the easiest to navigate that I have seen in some time. Free Valet Parking and for Take Out.